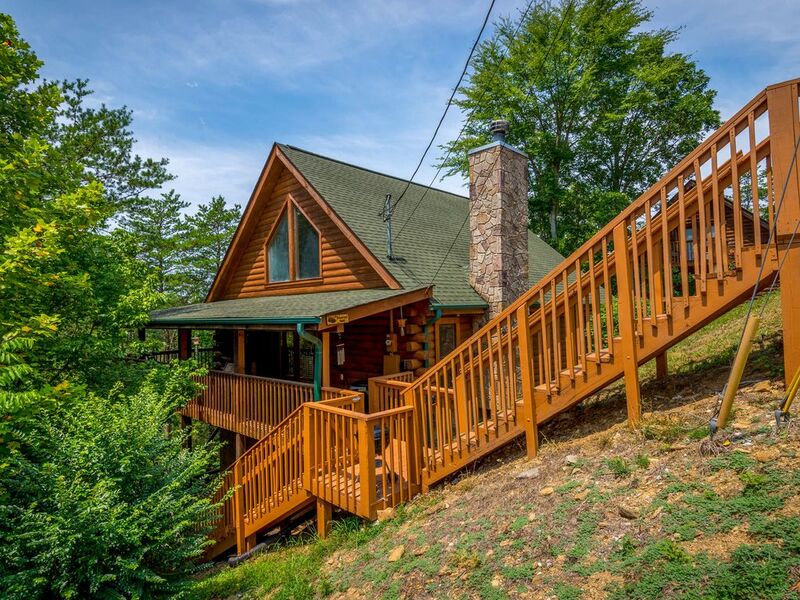 Nestled on the outskirts of the Smoky Mountains, ‘The Dreamers Nest,' a rustic 2-bedroom, 2-bathroom Sevierville vacation rental cabin, is ready to welcome up to 6 guests for a retreat filled with outdoor adventures. With remarkable ski slopes and hiking trails just a short distance away, you’ll never run out of the abundance of beauty coating the area. When you’re not out exploring, enjoy a cocktail on the home’s wraparound deck or soak your sore muscles in the private hot tub! Escape the hustle and bustle of everyday life to enjoy a peaceful stay at the ‘Dreamer’s Nest.’ This mountain cabin will immediately entrance you with its rustic wood paneling, spacious open-concept layout, and mountain-themed decor. After a long day exploring the Smokies, curl up in front of the wood-burning fireplace and with a good book and listen to the crackling of the fire. Bring out one of the home’s board games and gather your travel companions together for a fun game night. While Pigeon Forge offers tons of restaurants, the fully equipped kitchen has everything you’ll need if you’re craving a comforting, home-cooked meal. Gather together around the dining table to dig into your mouthwatering feast. If you’d rather enjoy an al fresco meal, use the charcoal grill to make the perfect summertime barbecue. Settle down after dinner on the rocking to take in the remarkable wooded views. During cooler days, soak in the private hot tub all day long and well into the night to soothe all your sore muscles. Once you’re ready to call it a night, you’ll find 2 bedrooms furnished with cozy and inviting queen beds, flat-screen TVs and en-suite bathrooms. If you’re not ready to drift off to sleep right away, catch up on your favorite shows or watch a relaxing movie. Feel free to take advantage of the Eagle Springs Resort’s community pool whenever you’d like to cool off or swim a few laps during your stay. This four-season location is perfect for outdoor adventurers no matter the time of year! Head to Smoky Mountain National Park, where you can hike Grotto Falls, Abrams Falls, Laurel Falls, Clingman's Dome, and go horseback riding. In the winter, be sure to hit the slopes at Ober Gatlinburg. Take a 25-minute drive to Gatlinburg to experience one of the most popular cities in the Smoky Mountains! From shopping and dining downtown to hiking in Cades Cove and exploring caverns, Gatlinburg has something for everyone. If golf is your game, hit the links at the Gatlinburg Golf Course, which is only 20 minutes away. Located just a 10 minutes from downtown Pigeon Forge, this cabin boasts easy access to all of your favorite Pigeon Forge attractions. Spend a day shopping at the outlet mall or check out the dinner shows at the Lumberjack Feud and Dixie Stampede. Dollywood is a must if you're traveling with any thrill seekers! The famous park is 15 minutes from the home. Be sure to spend an afternoon exploring The Island, a playful destination featuring unique shops, casual restaurants, and amusement rides. Take a spin around the 200-foot-tall Ferris Wheel located at the very center to get a birds-eye view of the area. Be sure to stop by downtown Sevierville for food and fun for the whole family. Forbidden Caverns is sure to delight everyone in your travel group. The Sevierville Convention Center is just 4 miles from the property; this is the ideal vacation rental cabin for anyone visiting the area for a convention! - Amenities include a fully equipped kitchen, air conditioning, central heating, ceiling fans, free WiFi, flat-screen cable TVs, DVD player, in-unit laundry machines, fireplace, hair dryer, furnished deck, private hot tub, community pool, and more! - Beautiful Sevierville location with easy access to restaurants, nightlife, shopping, hiking, skiing/snowboarding, shows, amusement rides, and so much more! Had all we need. It was every bit as advertised. Cabin was very nice and pretty clean! The hot tub could’ve been a little bit more private! The owner fees I thought were outrageous and I may not rent from VRBO again because of that! The location of the cabin was perfect. The cabin was very clean. I have stayed in many cabins in the area as we come a few times a year and will definitely stay here again. Thanks for sharing your wonderful cabin with us, we had a great time! Propers was nice, but walls are thin. Heard the hot tub and heater all night. But overall was very clean and modern. "Thanks for your input. We would have happily assisted with the hot tub if it was mentioned during your stay. We appreciate your feedback and will take your suggestions to improve for our future guests." The property is well equipped should you want to stay in the cabin, relax and cook a meal.